Located in the middle of Aberystwyth, the Four Seasons Hotel is perfectly situated for those looking to explore the town and local area. The hotel is only 200m from the Victorian promenade, and 500m from the Pier, where during the summer you can dine outside and enjoy the views, or during the winter months enjoy the breath taking displays by the local starlings. The Four Seasons has a courtyard terrace at the rear and a traditional restaurant open all year round. The cosy bedrooms all have a fresh feel and modern decor, creating a bright environment for you to relax during your break away or the perfect atmosphere for you to work if you are staying on a business trip. 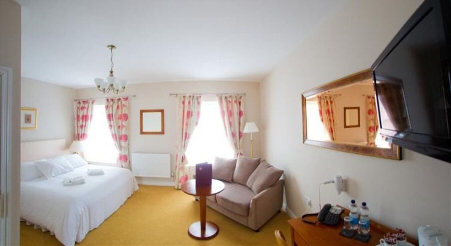 All bedrooms feature a flat screen TV,as well as tea and coffee making facilities and private bathroom. We serve hearty breakfasts, light lunches, afternoon tea and a varied evening menu daily in our restaurant. Our bar offers a range of beverages and snacks, and guests can also take full advantage of the terrace during the warmer months and dine outside. The hotel itself is a 5 minute walk from the train and bus station. There is complimentary Wi-Fi throughout the hotel and there is also a limited car park to the rear of the hotel.